Since 2008, a major Operator in West Africa has been developing the offshore Awa-Paloukou near Pointe Noire, Republic of the Congo. The target formation in this field encompasses the Sendji carbonates consisting of a mixture of limestone and sandstone of varying qualities and exhibiting poor petrophysical properties. Tests also revealed that the formation was more than 80% soluble with 15% hydrochloric acid (HCl). To determine how to best develop this low permeability carbonate field, the Operator drilled four wells deviated 10 degrees from vertical, and used two stimulation techniques for comparison. The first stimulation design involved proppant fracturing, and the second used acid fracturing. Ideal conditions for acid fracturing include carbonate content between 75 and 95% and bottom hole temperature less than 250°F. Proppant fractures are known to result in better fracture conductivity than acid fractures; however, as permeability decreases, this fracture conductivity becomes less important. Because of their high solubility, carbonate formations are preferentially acid fractured; whereas, sandstone is typically proppant fractured. However, there are no guidelines for fracturing mixed formations with solubility greater than 70% with HCl. The Operator wanted to compare the two completion designs in a single reservoir in order to answer the question as to which method should be used in a mixed formation. The Sendji carbonates lent themselves well to this study because they contain a heterogeneous mixture of both rock types and would, in theory, react positively to either completion method. There was an additional risk of breaking into water-bearing zones above and below the target formation making tolerances in executing the designed completion tight. Drawing from their success with Packers Plus in similar fields, including the Kitina and Foukanda, the Operator used the Packers Plus StackFRAC® multi-stage completion system to segment the wells into stages and conduct both stimulation types. The StackFRAC system gave the Operator the flexibility to reach fracture pressure with both acid and proppant. In addition, the system provided the ability to close waterproducing zones in the wellbore through use of the Drillable Closeable (DC) FracPORT™ sleeve. This allowed the Operator to fracture only the upper and middle sections of Well-1 (Table 1). The first two wells were hydraulically fractured with 20/40 size, intermediate-strength ceramic proppant. Two stages were placed in the first well and three in the second. The third well had three stages, two were acid fractured and one was matrix acidized with 20% HCl. The fourth well was acid fractured using 20% HCl in all three stages. Table 1 shows that the proppant fracture half lengths generally measured longer than the acid fracture half lengths; however, the acid fractures produced better initial production (IP) volumes (Figure 1). The proppant fractured wells observed IP values below that of the exploration well in the field. Stabilized production was also below expected levels. In order to improve production, an acid wash was conducted to reduce the positive skin factor produced by damage from the proppant fracture itself. 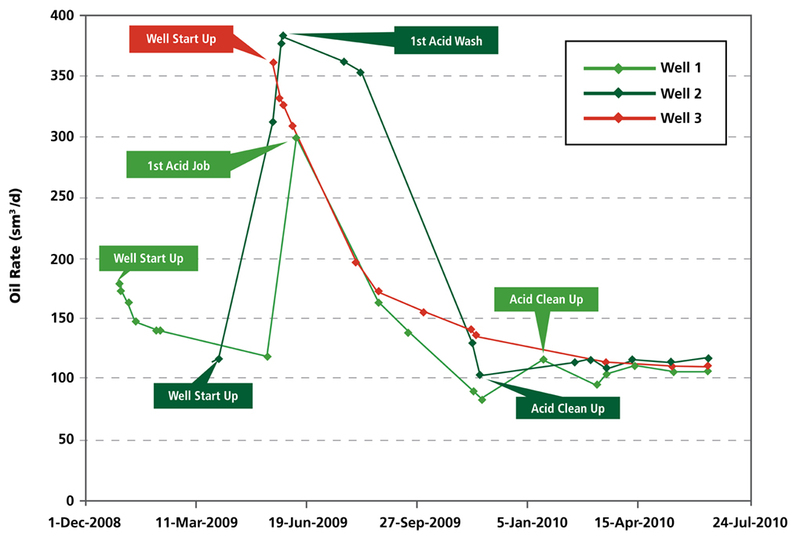 Once cleaned, the proppant fractured wells and the acid fractured wells observed comparable production (Figure 1). This study showed that treatment selection is not always straightforward and should be carefully designed and selected. In low permeability reservoirs like Awa-Paloukou with high solubility, acid fracturing may be a cheaper, more attractive solution with less associated issues like proppant flowback and post-treatment clean-up. No matter what treatment is selected, whether acid or proppant, the Packers Plus StackFRAC system has the ability to successfully deliver it.